The United Nations Global Compact initiative has recognized 3A Composites long-term efforts to offset its carbon footprint; protect, restore and promote the sustainable use of land ecosystems; manage its balsa forests sustainably; reverse land degradation and desertification; and curb the loss of biodiversity. The Awards’ ceremony was held in the J.W. Marriott Quito in Quito, Ecuador, on the 21st of November and organized by Global Compact Colombia and Global Compact Ecuador, with the institutional support of the Bogota Chamber of Commerce – whose Technical Secretariat is in charge of Foretica Spain – Deloitte, Media Partners Ecuador, and other private and public organizations. From the 150 projects presented in this edition, 61 were honored in one or more of the 17 SDG award categories. “This recognition supports our global strategy to become a carbon neutral company by 2020. What we are doing in Ecuador is a successful extension on what we seek to do everywhere: developing and supplying ultra-performing composite solutions from sustainable resources to help industries become greener, while conducting our business in a sustainable way”, said Roman Thomassin, CEO of 3A Composites Core Materials division, producer and manufacturer of the AirexBaltekBanova products. “This Award is a moment of pride for all our people – everywhere, and is an important step towards achieving the goals we have set for ourselves to become a carbon neutral company”, added Thomassin. “This Award illustrates our focus on the environment and best sustainability practices in our daily operations. 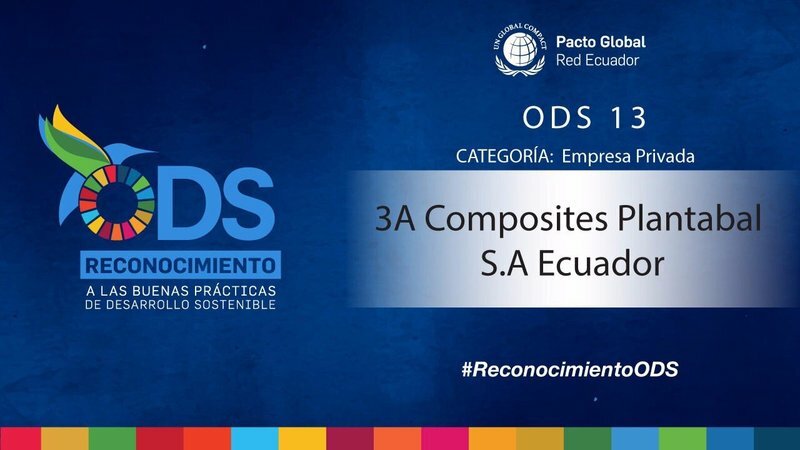 This recognition is for everyone and motivates us to continue with this important work”, said Ramón del Pino, General Manager of 3A Composites Core Materials Ecuador operation. Global Compact is the largest sustainable corporate initiative in the world. In Ecuador it is present since 2011 and currently has 115 active members, among organizations of all sizes and origins. The objective of the Global Compact Award is to celebrate and reward the best sustainable practices that are developed in the countries where is present, and is oriented to public and private companies, non-governmental organizations, foundations, unions, and academic institutions. This initiative was born under the objective to promote the corporate contribution to the United Nations 2030 Agenda for Sustainable Development. The United Nations Global Compact is a call to companies everywhere to voluntarily align their operations and strategies with ten universally accepted principles in the areas of human rights, labor, environment and anti-corruption, and to take action in support of UN goals and issues. The UN Global Compact is a leadership platform for the development, implementation and disclosure of responsible corporate policies and practices. Launched in 2000, it is largest corporate sustainability initiative in the world, with +9578 companies and +3082 non-business signatories based in 160 countries. 3A Composites Core Materials is a global organizational unit within 3A Composites, part of Schweiter Technologies (SIX Swiss Exchange: SWTQ), with operations in Europe, the Americas, India, China and Papua New Guinea, that has pioneered the sandwich technology for over 75 years. Its AirexBaltekBanova brand provides sustainable, lightweight and resource-friendly, high-quality core materials (broadest portfolio in the industry) to enable the production of lighter and thus more energy efficient end products for wind, marine, rail/road, aerospace, building/construction, interior, industrial and other applications. We have three manufacturing plants in the United States and are headquartered in Davidson, NC.